Review: "Lover Under Cover: Set the Night on Fire" - Sea of Tranquility - The Web Destination for Progressive Music! Lover Under Cover are a new Scandinavian supergroup (hateful term) featuring the talents of Mikael Erlandsson (Last Autumn's Dream), Mikael Carlsson, Martin Kronlund (Gypsy Rose, Phenomena), Perra Johnsson (Coldspell) with keyboard contributions from ex-TeN man Ged Ryland. Jorn's Tor Erik Myhre also pitches in and Kronlund handles the production. Kronlund handling production is always a good thing, it is generally a guarantee of quality and so it proves here. On occasion I have found Last Autumn's Dream a tad wimpy yet highly tuneful so it is pleasing to report that Set the Night on Fire gives Mikael Erlandsson the chance to get his pipes around more rocking tunes. That is by no means to suggest that we're dealing with Deicide levels of metal here but the music is tougher than LAD. The tunes are highly contagious though especially "Angels will Cry" and "Hero" and there is no doubt that this album is a fine example of modern melodic AOR. 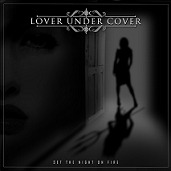 The group Lover Under Cover are releasing their hard rock debut titled Set The Night On Fire. A new Swedish four piece band Lover Under Cover brings together members of Last Autumn's Dream, Gypsy Rose, Phenomena, Salute and Coldspell. For a hard rock album Set The Night On Fire is a very solid first effort and even though not all the songs managed to set my world on fire I did find them appealing, and with eleven on offer there are numerous tunes that did impress much more than others. Love Under Cover's Set The Night On Fire naturally reminds of what could be considered the best of times for melodic rock that is the 80's, but I should add that Set The Night On Fire doesn't sound dated. Lover Under Cover also have enough diversity in their songs to keep hold of the listener's attention, kicking off with "My Best Friend" as the band gets the party started in vibrant rocking fashion and is a promising introduction to Love Under Cover's material. Next and to one of their most catchy mid paced melodic numbers and the song I would choose to release as a single "Angles Will Cry" and this is more up my alley so to speak quite a standout track with all the desirable musical elements to draw you in. "Hero" and "Through The Storm" are other highlights of Set The Night On Fire. Lover Under Cover have started on a encouraging note with Set The Night On Fire, with an experienced line-up including vocalist Mikael Erlandsson (Last Autumn's Dream / Salute) this is a promising new melodic band.